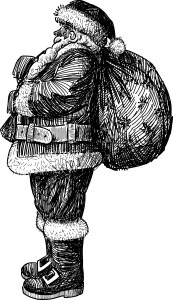 Santa Claus here (you know, the guy who has filled stockings and piled presents underneath your family’s Christmas trees for many, many decades). It’s been awhile since I’ve compiled a Christmas List of my own, which details what I think YOU should get ME for Christmas. All I do is give, give, give, give, give and this year is the year when I will take, take, take, take, take. Please note that this is a milestone for me, as I only take a year off every century. None of you know what it’s like to fill the position of Santa Claus. None of you can say, “I so understand what Santa’s responsibilities are every year,” or “What a tough job Santa has!” Unfortunately, my job description failed to mention that the saints of yesterday bred the sinners of today, who have bred the devils of tomorrow. These kids (yes, your grandchildren!) just can’t get enough. The longest Christmas List I received last year was poster-sized and in 10-point Times New Roman font. C’mon now. You all must take responsibility for these monsters who think it’s charming to sit on my lap and scroll around on their iPads, pointing to every little toy that they added to their “Wish List” on their “favoritest” app. Please understand that every year, I have to sit down and read millions of emails (that’s right—I don’t get letters anymore) from these little boys and little girls who don’t know how to spell or punctuate. These kids are lucky I don’t hit the “Reply” button because you know what I would give them? Grades. Bad grades. And then they could go write about me on “Rate My Santa” or whatever that tacky website is called. You can’t possibly deny that your grandchildren want gadget this, gadget that. “Give me an iPad, Santa, or I won’t believe in you ever again!” “By the way, do be sure that my new iPhone is the yellow color!” Yeah, okay . . . you’re a kindergartner with an iPhone in your pocket and an iPad in your lap. Real sweet. All you’re missing is some headphones so you can walk around like all the rest of ‘em. See that? Simple. Now, if only you could teach your grandchildren to be more like Santa Claus because he asks for little and gives a lot. We’ll see ya’ll next year. Kayla Pongrac is an avid writer, reader, tea drinker, and record spinner. Her work has been published or is forthcoming in Vinyl Poetry, Split Lip Magazine, Oblong, HOOT, Right Hand Pointing, and Nat. Brut, among others. When she’s not writing creatively, she’s writing professionally—for two newspapers and a few magazines in her hometown of Johnstown, PA. To read more of Kayla’s work, visit www.kaylapongrac.com or follow her on Twitter @KP_the_Promisee.